Russian River Vacation Rental #13390 LakeHouseVacations.com Rent Me! Sunset! Hot Tub, Stunning Vacation home above Guerneville! 15% Off Thru APR! Reflections! Hot Tub, On River! 3 bedroom, 2 bath! 15% Off thru APRIL! 15% off APRIL, 3 nights for 2, SPRING RATES to May 20th! Guerneville Cottage is an adorable, quiet, charming studio cottage located high in the coastal redwoods! The cottage is only 1 1/2 hours north of San Francisco. Located 1-mile west of Guerneville, close to everything yet nestled quietly in nature, the Guerneville Cottage offers the best of both worlds; serenity away from the city and/or endless outdoor activities. The cottage has a very comfortable queen size bed, cozy gas/log fireplace, fully equipped kitchen, a small comfy reading chair, 2 beautiful decks surrounded by redwood trees, lush plants, birds, and "Skip" our resident chipmunk. Lots of windows and a large skylight bring the outdoors in. Relax under towering redwoods in the cozy HOT TUB!!!!! Other amenities include; TV/DVD/VCR, cable, movies, stereo, CD's, games, books, and a BBQ. We have received only rave reviews from our guests. Just a reminder; The maximum a house sleeps is the maximum day or night. 3 night for 2 Nov thru March! Holidays Excluded. 2 cars max. Quiet hours 9:30 - 7am, to be observed by all guests. Cancellations: Should you find it necessary to cancel your reservation before 30 days of arrival; a 210.00 cancellation fee will be charged, and the remainder of your payment will be reimbursed. Cancellations less than 30 days prior to scheduled date of arrival will be given a refund ONLY if the home is re-rented. Payments for bookings are refundable only to the extent we are able to secure a replacement booking. If the property does not re-rent, you are responsible for the total rent of the house including all fees, taxes, and rent. Changes in rental dates or homes can be done for a $35 fee. Although we were anticipating a more private space based on the description (i.e., further from neighbors and more out of town), our stay was just fine for a birthday celebration with our small dog. We had some trouble with Internet connectivity, including access to the Smart TV apps (we had to use our own login information as well), which we did not attempt to resolve because it was not a main purpose of our stay and there were many DVDs provided. Also note that the shower is very small and the patio area shares a fence with what appears to be the main property, with some areas of the place easily seen by the neighbors. The roads up to the place are very steep and narrow as well. Overall, we had a good time staying at Guerneville Cottage, but we may have chosen a cheaper option had we known that it is not quite as private as we had hoped. Thanks!" I recently moved from Hawaii to Santa Rosa to start a new job. The Guerneville Cottage was the final landing place after the stressful move. It was just the thing! I really enjoy the light through the kitchen window and the bed and heater were sooo comfy. Perfect place to rest and decompress!" Very nice little space to call our own for a couple of days. Romantic and exclusive space to retreat and refresh." What a wonderful hideaway, tucked totally out of the way of the rest of the world. We had a wonderful time and we’re able to fully unwind, relax and enjoy the new year away from it all. Beautiful little cabin, perfect for two people with a wonderful deck, hottub and grill! The kitchen is small and a bit sparse to do extensive cooking though. " Our short getaway was awesome. We loved the cottage, and would definitely stay again. We had everything we needed and enjoyed a break from the busy day to day life. It was clean, neat and just perfect. " Had a very good time staying at the Guerneville Cottage. Perfect for 2 people to relax in the woods and soak in the spa. The address does not match were the front door actually is located. The front door is on Huckleberry Way. A little tough to find so perhaps a link in the directions like this one would be helpful. "So Relaxing - will be back!!! This place was so relaxing for a little getaway! The location was a little harder to get to than expected only due to the steep hills, but doable! It is so quiet and tranquil you couldn't ask for much more!" Our cabin was perfect! It had all the needed amenities. The hot tub was amazing (we probably spent half of our stay in it). We feel totally refreshed and will absolutely be coming back, next time for longer!" We came up to get away from everything for a couple days. This little cottage is nestled in the gorgeous redwoods, and the hot tub and deck are just perfect to relax. The cottage is perfect for 2 people and the kitchen had everything we needed. The bed was extremely comfortable and the sheets were luxurious!! The location is perfect to go visit the redwoods, hop over to Bodega Bay or go to the wineries. We truly loved this little gem, and will definitely be back!!" The cottage was very much as described - quaint, very clean, well taken care of. The decks and spa are amazing and it was one of the quietest places we've ever stayed. Super comfy bed and awesome tv (an amenity many overlook). It was a great time." From the moment we walked down the pathway to the adorable little cottage to the last sunrise the morning we left, everything was beyond what we expected. A perfect place for a romantic getaway for two. " Apr 24, 2018 - Phil and Katie L.
Our stay at the Guerneville Cottage was beyond what we expected. It was, to say the least, perfect! If you are looking for the perfect, romantic weekend this is the place. I felt like I was in a tree house in the woods and far away from the real world. We had the perfect kitchen to cook our meals and then the best background ever to eat outside. The hot tub was the icing on the cake!! I can't wait to stay here again, or better yet, to see what other rentals properties we get to check out what Dillon Beach Property Mgmt has to offer!! Thank you so much! It was everything I could have asked for plus so much more!!! " My wife and I stayed there for two nights. We enjoyed every minute of it. Just right for two people. Very relaxing and quiet, with plenty of things to do within 30 minutes. I would definitely stay there again"
The Gurneville Cottage was the perfect little getaway for my wife and I for our anniversary. They gave a bottle of champagne to celebrate as well. We loved how peaceful and private it was, the place had a really cool feel to it and spa just topped it off. Would stay there again for sure." I was surprised I was able to rent the cabin during the peak of summer. What I found was pure bliss. Such an adorable cabin! The jacuzzi was a fantastic feature! I will rent it again. " Arriving at Guerneville cottage in the late afternoon was like discovering where faeries live--it was magical! The grounds are lovely and the cottage itself is well appointed with a fully stocked and functional kitchen. I was depending on Waze in my rental car but he internet in the area is iffy at best--I ended up buying a map as back up. I loved Guerneville cottage & still give it a 4.5 star rating despite the power outage and fire as result of a transformer exploding across the road. My partner, our two big dogs and myself enjoyed a weekend at the cottage. Short drive to downtown Guernville where there are lots of places to explore and good food to be found. The studio cottage is setup well with very nice amenities. The bed was super comfy and all linens were cozy. We made breakfast and a dinner at the cabin and had everything we needed for simple prep. Overall we really enjoyed the weekend. " Aug 15, 2017 - David A. The cottage was outstanding! Very peaceful and well kept!" Very relaxing and loved the location- we will definitely be returning!" Every aspect of this rental experience was professional and made easy for us by the attention to detail and excellent communication. The cottage was gorgeous and just what we needed to rest and rejuvinate." Such a fantastic stay in a perfect setting. Private tree top cottage with tranquil deck n glorious hot tub! We were in heaven. Thank you so much for taking such thoughtful care of this lovely little oasis in the redwoods. " We had a wonderful time. the cottage was fantastic. Can't wait to go back!" This was the most marvelous of vacations i've been on. The cabin was adorable and cozy and the outside was absolutely stunning and beautiful! Thank you for letting me stay at this wonderful little place, it was amazing!" May 09, 2017 - James M.
"Great little cabin for two! We rented this little cabin to have a quiet, peaceful getaway for my 40th birthday. The cabin is small, but cozy and comfortable. The kitchen was well stocked with everything we needed to make dinner. The outside space private, and the hot tub was great! It was the perfect retreat for two!" This place was fabulous. We had a great time." This cottage is perfect for a romantic getaway. The kitchen and bathroom were newly renovated. The bed was so comfortable! The garden area was amazing!" We loved this place. The yard space and hot tub really helped make this little cottage feel spacious and the trees provided a great balance of sun and shade. Amazing how quiet the neighborhood is and, in spite of it being dotted with other homes, you feel surprisingly secluded - awesome space to getaway from it all...if even for just a few days. We'll be back!" We enjoyed our stay in the cottage. It is pretty much as described, although I was surprised at how dark it was, even on the deck. Also, it is not quite as private as I had hoped. In fact the deck is exposed to the road on one side. The place is really well fitted out, and there was great communication with the owner who lives next door. Everything you need is there and it is really comfortable. " This was an absolutely lovely weekend getaway experience - for my husband's and my anniversary. We loved it. So did our dog! The owners / property managers had thought of everything - absolutely everything we needed in the kitchen was there. We brought groceries and were able to cook and just stay put the whole weekend. Beautiful location and quaint little clean, romantic cottage." so lovely, this little place was a perfect secluded getaway for me and my gf. definitely a good alternative to really woodsy cabins, it was rural with out being in the boonies. Natural/suburbia haha. Very clean and very accommodating. will be back!" Mar 01, 2016 - Justus C.
Easy and great experience. Unit and hot tub are very private. Great little get away. We coo"
Adorable cottage. Very well provisioned and absolutely spotless. It was quite cold during our stay, so we didn't spend much time on the spacious deck. The interior has just one lounge chair, but we solved that problem by bringing in a light weight padded patio chair from the deck. Voila! Comfortable seating for both us as we enjoyed some wine and conversation." Beautiful Unit and perfect place to cook while enjoying the feeling of being up in the trees. Loved walking the hills around the cottage and meeting the friendly neighbors." This is a great private getwaway! Very quiet, clean and comfortable. Great bed!!! Great deck and hot tub. Our favorite part was the morning hot tub with our coffee and crisp air! Loved the town, wish we could have stayed longer! " This property was nothing short of amazing. So charming, peaceful, gorgeous setting. My husband and I loved it. We had an amazing 5th wedding anniversary getaway. The location was great as we could get to the coast or wine country in 20 minutes. We would absolutely recommend the cottage to anyone. Thanks for a fabulous stay! " nice place overall, bathroom very small when you sit down you almost hit the sink,have to buy your own charcoal to bbq for the price you think they could throw in a bag,was taking a shower owner turned off water do not know why they did not tell us since owners are rite next door, was in hot tub a hot tub maintance guy comes on to property said he was there to do maintanance why he would come when someone was there does not make sense should schedule maintance when no one is renting property, only had 2 towels for shower and hot tub whould recomend having more, stairs going up to property are just rocks and small kind of dangerous "
Loved the place. Everyone I showed pictures of the cottage loved the place also. We'll be back!" If you are looking for a quiet and peaceful place to spend a weekend this is the place to come. 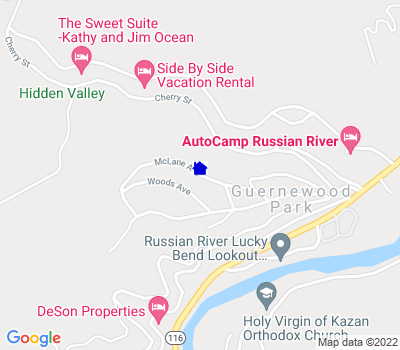 The cabin is tucked away in the redwoods and offers plenty of privacy while still being close to downtown Guerneville and the Russian River. It is a fantastic break from the hustle and bustle of the city life!!" Very relaxing, felt secluded. The owners were nice and attentive, if needed. They also took care of every detail -- it shows in how the property is maintained. They are a little heavy on the legal aspects of the agreement and rules, but they are professional and run a good outfit. " Very cosy one room cabin with pleasant outdoor space, including a hot tub. Lovely to relax on the deck looking up at the redwoods." The cottage is small, but has a lovely deck and is surrounded by beautiful redwood trees. We enjoyed having our two dogs with us. We fell in love with Guerneville and will be back soon!" This cottage is absolutely charming! Yes, it's small but it's cozy and I'd recommend it! The cottage is hidden and private and the deck and property are peaceful. The redwoods surrounding the cottage are spectacular. We'll definitely make a return visit! " Jul 31, 2015 - Anahita B. Lights staying on outside may it difficult to sleep.Had to use on towel all week." Had a great time. Great for the eyes, garden, deck was very nice. Quiet, away from traffic. Accurate property description and very clean. It was a pleasure dealing with "staff"." Beautiful and tidy property in the woods. Karyn and Stacy were generous and accommodating hosts. The house was in great shape, and the hot tub was fantastic. Only drawbacks were: (1) the house isn't very secluded, close to neighbors; (2) the rental contract was long and forbidding -- though the hosts didn't seem litigious at all. Overall a great stay! Thank you. " I had been looking for a peaceful place for a personal retreat and this property was perfect for that. The moment I stepped through the redwood gate, I felt I had entered a very private woodsy world without being that far from other homes. Two decks with lovely sitting areas would have been tempting for the summer, but being winter I spent more time sitting in a comfortable little chair beside the gas run pot bellied stove. I did use the hot tub on the deck at night which was well cared for and sited with beautiful lights. I loved the kitchen which was new looking and had large windows looking out into the trees like a tree house. In every way it was just what suited my needs. The only minor problem, was that the roads getting to the house were narrow, very steep, and a bit confusing at first, but it was well worth the effort." I really loved this cute little cabin, it's very remote and private, awesome grounds, great ammenities. Overall experience was a 10!" Perfect cabin in the woods for 2 (and one big dog who loved walking with us down to the off leash river access down the hill). This place was amazing - charming, thoughtful touches everywhere, private, and just beautiful. Walkable to the river and to some restaurants (if you are ok walking hills). Not right in town but that was ok for us. Would definitely stay again." this was a beautiful property, but we could have used a warning about how steep the roads and confusing the signs are! Sitting in the hot tub neath the redwoods was magical. We hope to come back some day. " This cottage is charming and in a wonderful location. Lot's of hiking, restaurants, etc. The hot tub was lovely and we really relaxed." The Guerneville Cottage was very quaint and a perfect getaway for us. We had privacy and lots of quiet time. The interior of the cabin is rather small, however, the details given to the space are very inviting. The outdoor deck is where I spent most of my time, and the hot tub was lovely after a long day. We didn't have a difficult finding the cabin, however, I could see how others was up a bunch of winding roads, but we didn't mind one bit. Thank you for a peaceful stay." The cabin and surrounding woods were very peaceful and relaxing. Half the time we didn't even leave the property for it was so soothing!" This quaint cottage nestled in the trees is a relaxing retreat designed to provide comfort indoors and out. The outdoor space is at least as big as indoors and features comfy recliners, a bistro for dining al fresco, and a hot tub to soak away. Indoors you'll soon forget that the cottage is tiny, as all windows provide the illusion that you're in the trees. The only negative is that the advance paperwork is somewhat confusing and contradictory, regarding towels. In one place, it suggests bringing your own towels, and when we go there, the towels were supplied. Perhaps it only refers to towels that you want to bring to the beach. " Small (but not too small), cute cottage perfect for relaxing. Very well taken care of and in a great location not far from everything." My wife and I stayed here for her birthday weekend. We spent a day tasting wine and a day out on the coast. This little house was a perfect place to return to at night. The hot tub was great way to end the day and the trees were a nice escape from the warm summer day. I picked this rental on my own and my very picky wife was extremely pleased. I highly recommend this place for a getaway. P.S. We loved Gary Farrell and Matrix and also highly recommend Hop Kiln and Thomas George." we were pleasantly surprised when we arrived. The cottage was just beautiful and nestled in the most perfect spot. The quiet was just perfect (except for noisy fridge which woke us up a few times throughout the evening. The hot tub was a huge plus and location fantastic. " All reservations were done online, easy & efficient. We booked at the last minute (Wed for a Friday thru Sunday stay) which made it convienent as a last minute recharge get away weekend. The hot tub is strategically placed and was awesome and we'll maintained. Just as described. We did not cook while there. One factor was the language of the contract that indicated extra charges if one thing was out of place, at least that was how I perceived it. Overall it was a great stay, a bit pricey for the off season. " We loved the cottage at first, but after learning that the cottage isnt really pet friendly, and by that I mean your pet is not allowed to go to the bathroom anywhere on or near the property, cant be left alone in the cottage and isnt allowed on any furniture, as well as we were responsible for cleaning the whole cottage, right down to the bathrooms, when we leave, we are on vacation we shouldnt be cleaning the cottage it should be included in the price of the rental. We also didnt like that the owners of the cottage were next door, it didnt feel private at all and we actually came back to the cottage one day and they had left notes on the door about our pet, we REALLY didnt like that we found it inappropriate. We also had to leave a week early for a family emergency and no refund was even offered to us or spoken of at all. We felt the cottage it self was cute and charming, but these are the issues we had with everything else. I wouldnt recommend this cottage for the reasons I stated, it was an uncomfortable stay." The cabin is perfectly cozy and can't beat the hot tub under the redwoods. Will definitely come back again!" Very nice property. Cozy and warm. My wife and I enjoyed it very much. I was taking a respite from a busy end-of-the-year Operating Room schedule, and enjoyed the TV and Cable options as well as the hot tub. My only concern is street grade and parking. Level parking would have earned a 5 Star Rating: It is a challenge to unpack and repack a vehicle on a steep grade. We enjoyed the comforts of the property very much. Thank you, Paul and Liz. " We have stayed at the Guerneville cottage three times now, the most recent stay was as a honeymoon to our elopement. The cottage is as lovely as ever, and we were there everything was wonderful. I have to mention a few things however that were unsatisfactory- I had difficulty with my communications with Stace, I found her moderately unprofessional is speaking with her on the phone, and a couple emails felt rude. Upon arrival at the cottage we were told to enjoy the complimentary wine and coffee- there was no wine, but we brought our own so we weren't too disappointed, and we ran out of coffee... and that was awful. This is one of our favorite places in the world so we will be back, however next time I will probably ask to deal with someone other than Stace and we will be sure to remember coffee, and probably wine. Thank you." From the moment we arrived we knew we had selected the right start to our vacation. It was such a quaint cottage. Beautiful decor and comfy bed. Especially loved the fireplace which was actually the working heat for the cottage. We were in the area to tour the coast and the Sonomoa wine area. Both were so easy to reach from the cottage. " Quaint little cottage. Loved the deck and hot tub! Perfect distance to wineries." My stay was wonderful. It was the first time I'd been to that part of California, and I cannot think of a better place I could have stayed. It was quaint, had all the necessities I needed and was just beautiful! I really enjoyed my stay and would definitely refer a friend. I hope to return one day soon; this time with my husband. Thank you so much for making your little cottage in the redwoods available to me for my time in California. :)"
My boyfriend and I stayed there for a couple nights. It was exactly what we were looking for. A secluded quiet retreat where we two supposed workaholics can do absolutely NOTHING but relax. The pictures and description are exactly as described. The hot tub was lovely and the deck chairs comfy. WE had a wonderful relaxing time at your property. Just what we needed." Cottage was fantastic, worked well for our vacation, convienient to wine tasting and the coast. Love the deck and hot tub! " We loved the little cottage in the redwoods. It was clean, comfortable, and lovely. The stove heated up the place quickly and you could open the windows to cool the place down quickly. The kitchen had everything we needed to cook, and there was a wonderful stereo if we wanted music, or a tv and dvd player when we wanted to watch a movie. The only difficulty with the property is the location. It's in a neighborhood of cottages/cabins on a very very steep hillside. We took our car that is a manual transmission and it was no fun navigating the small streets at very steep angles. Just bring your small automatic car! Otherwise, a beautiful location and place to relax." My bf and I took a 2 day mini vaca for his bday from the city at the adorable Gernville Cottage. We both loved everthing about our stay. We highly recogmend it!" and when I say "hillside", wow. you better have a car that can climb. the neighborhood is dense with homes. I was expecting it to be a little more remote. that said, we felt remote and private both in the cottage and on the deck. the only way it could have been better was if it had a view other than looking up at the redwoods." A beautiful little cabin close to town with everything you need for a relaxing getaway!" Guerneville Cottage is charming and romantic; I felt like I was sleeping in the middle of the woods - very quiet location yet a short drive to town. The cottage had nice kitchen space and dishes/cooking utensils, etc so that we could enjoy cooking on the days that we didn't want to eat out. The hot tub was wonderful. Definitely a great place for a couple to stay; I was sad to leave." The biggest problem was that there is no place to unpack and no place to set luggage. In such a small space it's unhandy to leave suitcases sitting in the middle of the floor. There were no surfaces on furniture or no luggage racks on which to set luggage. There was no place to hang clothing. I guess if we had been locals there for a weekend with a small bag it would have been o.k. We were there 5 nights as part of a two week vacation to northern CA, so we had two bags a piece. I finally took some towels out of a couple of drawers and unpacked my biggest suitcase and put the empty suitcase in the car. Most of the drawers were filled with DVD's that could have been put on a shelf or something. We also felt the price was a little too much for such a small cottage compared to what we were able to get for another much larger and nicer one bedroom cottage by the ocean near Mendocino for a lesser amount. Also, there was no Wi-Fi. We liked the setting and the location." Beautiful cottage in the redwoods...we loved the feeling of being away from it ALL! And so enjoyed the deck and hot tub..thank you for sharing your heavenly nest with us!" The cottage is nestled among tall redwoods,a private deck with hot tub extends just outside the front door. Ideally situated to visit the incredible lush beauty of the Russian River valley and surrounding area." Loved the cottage! Would definitely return." The cabin itself is adorable. We felt like we were staying in a tree house. Very cozy and serene with beautiful views of the redwoods and surrounding ferns and greenery. Once you get to the cabin and inside the gate you will find a darling secret garden-like setting. We were a little disappointed with the road to get to the cabin as it was very curvy and straight up a narrow road and the cabin was not easily found. Gurneville was a disappointment. Sadly, the town seemed really run down." Relaxing place to stay... close to town and jacuzzi a plus...."
For a longer stay, probably would have wanted a larger place, but just perfect for two for a long weekend. For myself I would have liked an even more remote location (nearest home was only about 50 yards away), but that is probably hard to find. I liked the spacious deck space (about as big as the cabin). Wish had had the time to use the hot tub, which looked very inviting. " The deck and surrounding plants/trees/flowers and garden decorations were beautiful and well-kept. It was clear that a lot of care is paid to the landscaping details. We ate breakfast each morning on the larger deck and it was wonderfully relaxing. I was a little disappointed that the cottage wasn't as secluded as the website made it seem, but it was still much more private than staying in a hotel. The bed was firm and comfy. The cottage had pretty much everything we needed. The only things that might have been nice additions are pan spray, a phone book and a dish towel. The CD collection was much appreciated and enjoyed. We didn't watch any movies, but there were plenty to choose from. I would have loved to see a set of dominoes in the games collection! The cottage was small, but all the windows, tall ceilings and skylight made it feel very open and comfortable. It didn't feel cramped. The hot tub was a great ammenity. The shower was very small, but the cottage was a good price, so I didn't really mind too much. The cottage decor was nice. Unique enough to not feel like a generic hotel room, but neutral enough to not be offensive or overbearing. Very close to town, grocery store, restaurants, which was convenient. There was a handy guidebook of local attractions and restaurants. The "Touch Of Greene" massage brochure is out of date, though. We went to the address printed on the brochure, but a different business was occupying the space. The wine left in the cottage for us was very tasty. I would stay here again. We had a great weekend. Thanks!" the cottage is a great place for some relaxing and romance. i would recommend it." The Guereville cottage is very cute, sort of rustic, in a serene and beautiful setting. It is small, however, which was fine for us, but may seem tight for some couples. And it seems to me anyway that it is sloping a little down a hillside. The hot tub was awesome, clean, new, amazing setting beneath the trees. Location was great, although it's up some steep hills, so it kept us from walking to town. " The place it TINY. The parking is parallel and questionable for two cars. IT IS NOT PET FRIENDLY as advertised." We had a great time at the cottage! It was exactly the kind of rustic environment we were looking for. And the setting was gorgeous! My only suggestion is for the business end: a hard copy of lease/credit card paperwork should be offered to be sent through the mail for those who don't have access to a printer. I was frustrated that--being a paying customer--I had to do so much extra footwork to get the paperwork printed, signed, and returned. However, the frustration was all out the window upon our arrival. I would love to stay at the Guerneville Cottage again." Thank you for making our 5 year anniversary exactly what we wanted. The property is very peaceful and absolutely gorgeous"
We had a wonderful vacation, full of just what we were seeking: solitude, serenity, beauty, nature, a stress-free environment, kindess. Meeting Kathy and Stacey (and Keeper) was one of the best parts--terrific hosts and people. " a beautiful cottage situated in the middle of the redwoods. quiet and quaint - a perfect weekend! if you'd like a peaceful getaway with a friend, or even by yourself, i highly recommend it." The Guerneville Cottage is one of the best places for an authentic R & R experince. From the moment we drove up the hill I knew it was a place to rejuvenate the mind, body and spirit. The location is ideal. Whether for short trips to the beach for a solitude walk or an afternoon of lunch and shopping in nearby Sonoma, Napa, Sebastapol or Petaluma. The town itself is charming and a walk through the Armstrong Woods is not to be missed. The cottage itself is a lovely, peaceful place to reurn to after each outing. The occassional soak in the hot tub was certainly an added benefit to our weray bones. We can't wait to return and highly recommend the cottage to anyone looking for a place to truly rejuvenate one's soul. Thanks so much for the experience, we will remember it fondly for a very long time."